HOW TO ORDER: Proceed though checkout and print a copy of your receipt and send your EMPTY Frama Accessmail / Ecomail / Officemail cartridge to: Mailcoms Ltd, 3 & 4 Heritage Park, Hayes Way, Cannock, WS11 7LT. This is a Accessmail, Ecomail & Officemail ink refill and Accessmail, Ecomail & Officemail ink reset service. It is ideal for your Frama Accessmail, Ecomail and Officemail ink cartridge. We will refill your original Frama Accessmail / Ecomail / Officemail ink cartridge with Royal Mail approved red franking ink and replace or reset the chip back to factory settings. 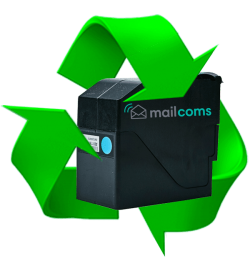 We guarantee this Frama Accessmail, Ecomail & Officemail refilling service will give the same quality prints from when it was new and last the same amount of prints of an original Accessmail / Ecomail / Officemail ink cartridge. Mailcoms will guarantee this Frama Accessmail, Ecomail & Officemail ink cartridge will offer a similar quality, life and amount of prints as the original manufacturers ink cartridge.